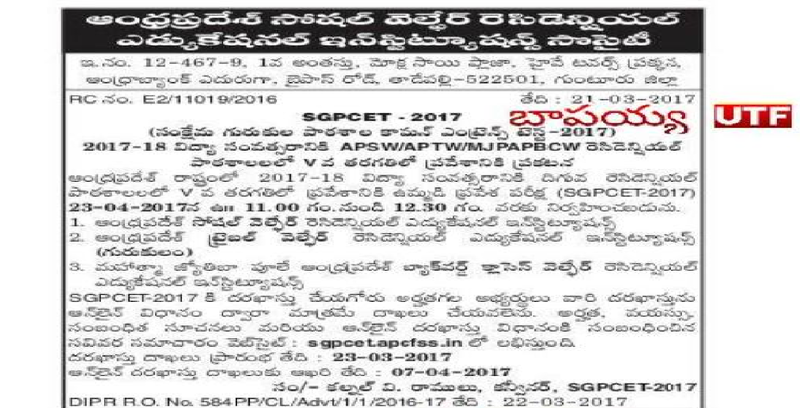 APSWREIS (AP Social Welfare Residential Educational Institutions Society) has published the SGPCET 2017/ Samkhema Gurukula Patasalala Common Entrance Test 2017 notification for admission into V class in APSW/ APTW / MJPAPBCW Residential Schools for the academic year 2017-2018. Applications are invited for admission into Class V in all APSWR Educational Institutions, AP Tribal Welfare Residential Educational Institutions and MJPAP Backward Classes Welfare Residential Educational Institutions across the State. 1. A total No. of 12,000 seats are available in V Class of (174) SW Residential Schools throughout the State of Andhra Pradesh. 1. The medium of instruction is English. 2. Daily routine starts at 5.00A.M with Yoga / Physical Exercise. 3. Emphasis on Co-curricular, Extra Curricular and Games & sports in the evening. 4. Free Education, Free boarding and lodging. 5. 4-pairs of Uniforms, 2-pairs of shoes, 3-pairs of socks, belt & tie for each student. 6. Computer Labs & Science labs. 8. Hair cutting charges for boy students. a) Admission will be given as per merit obtained in SGPCET(Common Entrance Test)-2017 and as per the choice of the student. b) The student may opt for more than one school as per their performance. c) The Convener/Co-coordinator has right to reject the admission, if the candidate is found ineligible or the information furnished while submitting the online application is found wrong. d) If same rank is secured by more than one candidate then priority will be given to the student of higher age. If the age is also found same, then priority will be given to the student with higher marks in Maths. If the age and Marks secured in Maths is also found same, then marks obtained in Environmental Science will be taken into consideration.